Rose Solari’s latest novel, A Secret Woman, addresses the perplexing premise of just how well one truly knows the most important woman in his or her life: mother. What could possibly have been so important that her estranged mother left the matter with Brother Paul and why was it specifically intended for Louise? When Louise’s journey finally deposits her at the monastery, the first of many mysteries to come is solved. Brother Paul has the box Louise made for her mother many years before—a painted box covered with delicate flowers and soft hues. It contained documents, photos and journals and once Louise has time to cull through its contents in greater depth, secrets are uncovered—secrets of a mother who was a completely different woman and far from the person who raised her daughter Louise. The journey, however, was just beginning and it would take Louise far from her American home and across the Atlantic where she would meet her mother’s former lover Lawrence Ware. Fictitious character Louise Terry and author Rose Solari are a lot alike. Louise Terry paints brilliant and coveted visions upon canvass and Ms. Solari is a real life force to reckon with given her ability to paint an intriguing and entertaining story with her words. Within the first handful of pages, I was hooked and feel confident in saying most readers will find they are able to gain an instant connection with Solari’s characters. There is an anchored balance between believable and unforced dialogues and scenes that set a fluid tone in support of a solid plot. Ms. Solari has measured control in her delivery in that she carefully guides her reader across the pages while creating consistent desire for the reader to find out what lurks beyond the next page to be turned. Her characters are rich and believable. They are all connected with the common link of the world of the arts, yet they have plausible and unique identities that work well together in making this a solid and enjoyable read. I applaud Ms.Solari with the many seeds of wonder she planted in the readers mind toward how well one person truly knows another—particularly if that one person was the one who brought you into the world. Simply put, this was a captivating read and it was effortless to turn each page from beginning to end. Thank you Ms. Solari! I look forward to your next book. 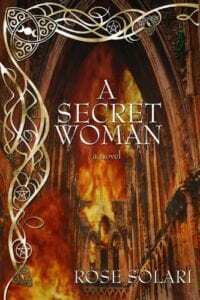 Quill says: A Secret Woman is a story that truly does encourage a thought provoking question: How well do we really know those we love the most?